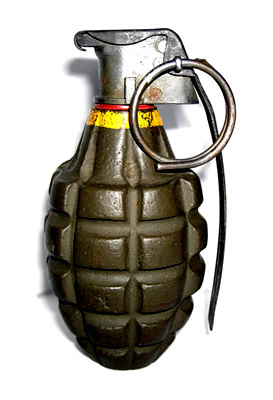 ZAMBOANGA CITY (Mindanao Examiner / Oct. 16, 2011) – Unidentified motorcycle men lobbed a hand grenade in front of a restaurant in Basilan province in the southern Philippines, but it failed to explode. The failed bombing occurred over the weekend in Isabela City, scene of past terror attacks in the restive Muslim province. Police said the grenade landed in front of the Twins restaurant near a Catholic church which was also bombed in the previous attacks largely blamed by authorities to the militant group called Abu Sayyaf which has links to the al-Qaeda and Jemaah Islamiya. The motive of the failed attack was unknown, but authorities said it had video recordings taken by a security camera from a nearby establishment of the two men as they tossed the grenade in front of the store. But it was not known whether the men had been recognized or not.